SJ: It depends if you count the hiatuses like having to go to school and rave culture. On and off I would say I’ve been gigging for between 1 and 84 years. SJ: Not a lot of words. A lot of props. Very stupid. Funny most of the time. SJ: The really bad ones influence me a lot. I watch them and think, please don’t be like that. I’m not naming names. I try to not let comedians influence me, I prefer to get inspiration from people like the dodgy woman in the chip shop, my kid and homophobic workmen. People who are around me all the time. But a huge influence on me was being taught by Doctor Brown and Philippe Gaulier. SJ: I wanted to be a vicar then a copper, then a singer but couldn’t do any of those in the end for various reasons. I’ve always loved ‘pretending’ so I very luckily became a professional pretender (actor). SJ: I lock myself in a room for a few hours and try to forget I am an adult and I need money and I am trying to pay the bills by making people laugh. Then I just start mucking about. After a few hours I have a coke float. Then I go to bed and worry myself to sleep. Then I wake up and start again. SJ: I act, write, and do voiceovers. I do comedy in all the gaps. SJ: Vomiting into a bag before I go on is really annoying. The rest of it is good. If it wasn’t then I wouldn’t do it. I’d buy a van and drive round France doing something, I dunno I haven’t really thought that through yet. SJ: Humans laugh the most. Babies are the best. Dogs are pretty good. Cats are very tough. SJ: I’ve not been heckled much, but then really I haven’t really gigged much. I wish I had because then I would be better at dealing with it when it happens. I hate it when it happens. I got heckled by 20 of my mates at my sixth form leaving do and I didn’t do comedy for 8 years after that. SJ: Stop thinking about it and just do it. Stop thinking. Everybody thinks about stuff all the time. Book a gig, even if you haven’t got any material. Then you have to get material together and you’ll think of something even if it’s just doing an impression of your Mum. 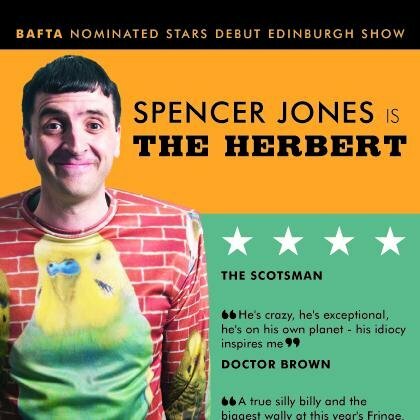 Spencer Jones is the Herbert is at Heroes @ The Hive from July 31st – August 24th (not 12th) at 15:30. More info.